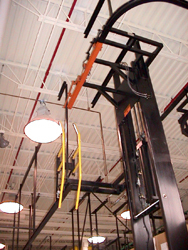 Gardner lifts are floor or ceiling mounted, designed to fit the particular application. 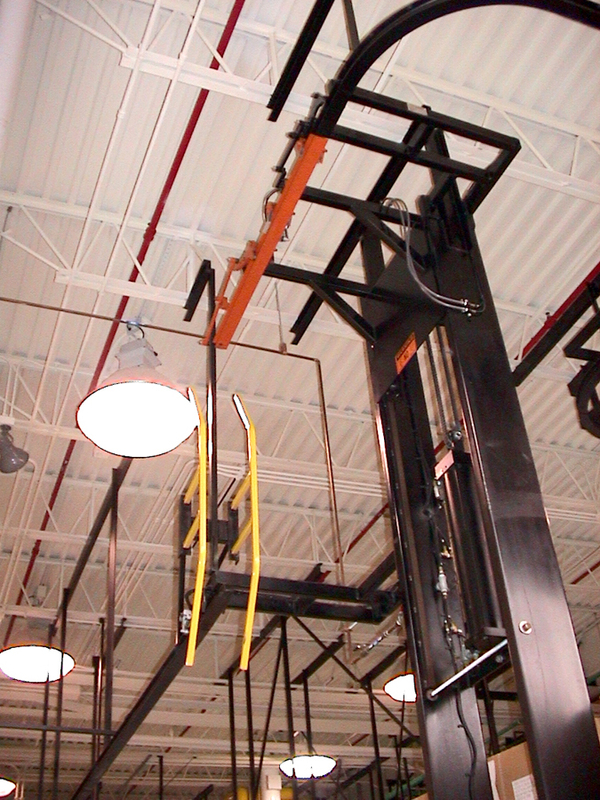 GMC lifts operate by means of pneumatic cylinders mounted to a frame. By using compressed air as an energy source we eliminate the problems associated with electric motors and their associated controls, positioning sensors, and brakes. The stroke of an air cylinder is always the same. All lifts are equipped with necessary safety interlocks. The Gardner Lift has a floor-mounted structural steel frame of welded design with a carriage that traverses the frame vertically. The carriage has a structural steel frame on heavy-duty cam followers. The cam followers roll on guides that are part of the frame. The carriage is raised and lowered by means of pneumatic cylinders mounted within the frame and connected by means of heavy-duty leaf chain, avoiding the problems and higher maintenance associated with wire rope. The carriage has a safety interlock which positively and instantaneously locks the carriage in the event of any failure within the lift mechanism. Position 1: A low position where a loaded sling is attached to an empty trolley hook. 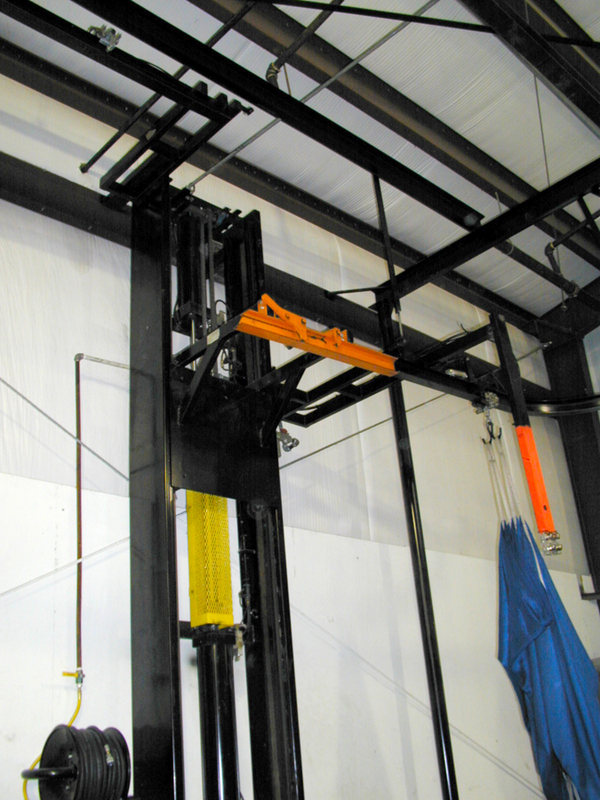 Automated slings are mounted on automatic sling frame/trolley assemblies and are picked up from this position. 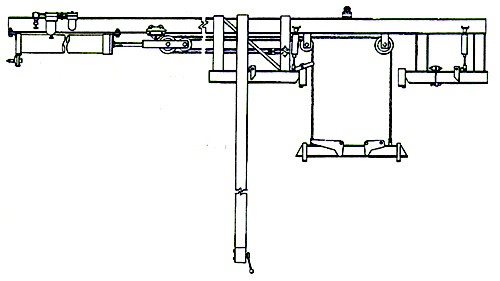 Position 2: A high position where the moving track section is mated with a fixed monorail track and the loaded trolley is automatically discharged into the monorail system by the release of a mechanical escapement trap. Position 3: An intermediate stop position where the moving track section mates with a fixed rail to receive an empty trolley and sling from the monorail system by the means of air operated equipment. A safety interlock is incorporated to positively prevent a trolley sling from being released from the escapement stop if the moveable track section is not in position to receive it. In many applications, because of limited ceiling height or a multi-level operation, it is necessary to raise and lower loads in process to achieve compatibility in the system. The Gardner Re-Elevation/De-Elevation Lift is used to accomplish this purpose. 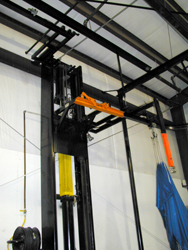 The lift is completely automatic and is equipped with necessary safety interlocks. A trolley rolling onto the moveable rail section of the lift activates the lift to raise or lower the moveable section to the desired position where it mates with the stop by gravity. After the disengaged load clears the lift, the lift automatically returns to its previous receiving position. The Gardner Horizontal Lift is designed to lower or raise a load without the necessity of transferring the load from one trolley to another. A typical application is the loading or unloading of extractors. 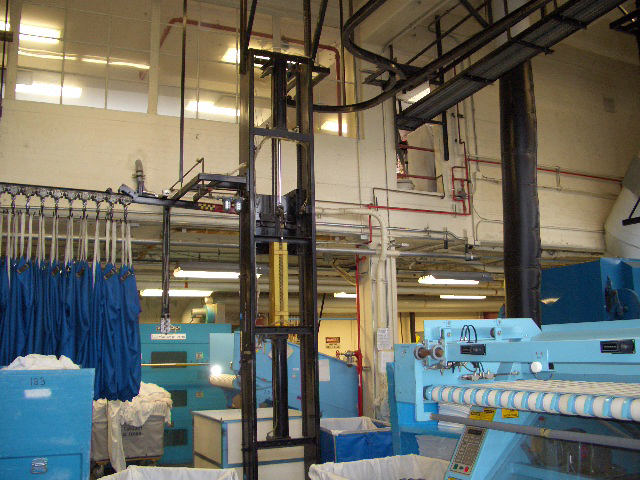 In the event that the required monorail storage capacity for washed and extracted clean linen is limited, a horizontal lift and a compatible monorail system can be designed to feed clean linen to a large dryer and/or to a shakeout table or flatwork feed conveyor for feeding an ironer.